Roadworks during peak hour. Screaming kids on flights (someone else’s, or worse, your own). The neighbours’ house alarm that goes off when they are on holiday. All of the above are certified pains in the neck and unfortunately, little research has been done into how best to prevent their occurrence. Even worse than these figurative dilemmas is actual neck pain, a condition which a large percentage of the Australian population experience on a regular basis. So much of the movement necessary for daily life, whether driving, talking or working, depends upon having good mobility in the neck. The good news is that this pain in the neck can be fixed. If you are one of the many people who suffer from neck pain, even the simplest actions are accompanied by stiffness, discomfort and prolonged headaches. Neck pain is caused by a range of factors, all of which affect the vertebrae, cartilage and ligaments which support the head. Poor posture, typically linked to hunching over a computer or a smartphone screen, is responsible for the vast proportion of neck complaints. Sitting, slouching or slumping at a desk for an extended period puts pressure on ligaments and muscles, as does reading in bed or sleeping on your stomach. If you have ever experienced an episode of pain when turning your head to the side, it’s possible that you have been suffering from a condition called ‘wry neck’. Brought on by sleeping in an awkward position, sudden jerking of the head or carrying heavy, unbalanced loads, this complaint is responsible for causing temporary, acute pain and stiffness in the neck. A more serious version of this condition is whiplash, where the jerking of the head strains the soft tissues of the neck. While whiplash is commonly associated with car accidents, it is an injury that can also be sustained through playing contact sports. The final major contributor to neck pain is degenerative disease like arthritis. Like all joints in your body, the cartilage cushioning your vertebrae wears down with age, and the result contributes to the condition osteoarthritis. When the firm cushion between two bones deteriorates, affected individuals experience pain, stiffness and muscle weakness which can make even gentle movements difficult. Think about your posture when sitting or standing, and make sure your desk is designed to help you sit (or stand) comfortably. Regular exercise will improve muscle tone and posture, while also helping to work against the muscle-tightening effects of stress. 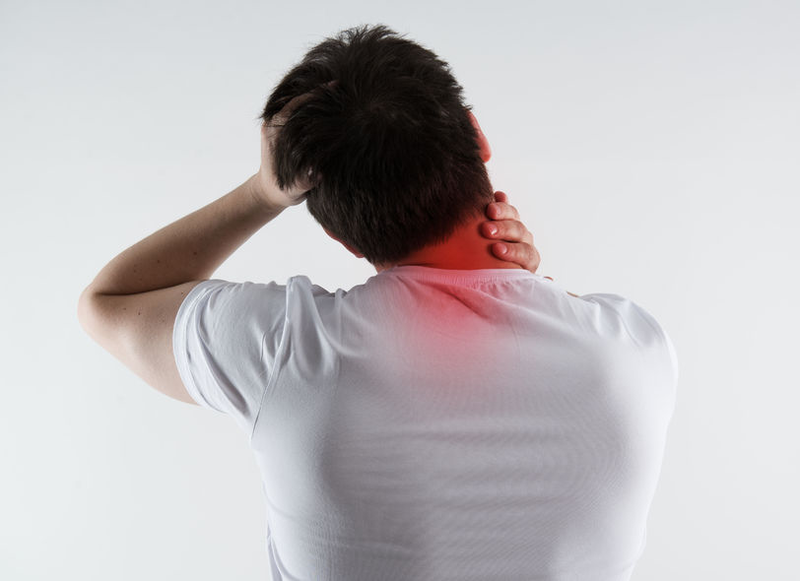 If you have sustained an acute neck injury, it may be time to consult a qualified health professional for a course of soft tissue massage, mobilisation, dry needling and scenar therapy. Taping problem areas can help support your posture, while a specific program of stretching and strengthening can promote greater stability from the neck muscles. Made up of seven small vertebrae, the neck plays a crucial role in your daily activities. By looking after the muscles, joints and ligaments in your neck you will help keep pain at bay, making you better equipped to deal with the roadworks, screaming kids and neighbours’ alarms when they inevitably come your way. Call us at (02) 9997 4970 for further details.